Why did I read this book: Three reasons: 1. I am a huge fan of Martha Wells’ fantasy fiction (see The Cloud Roads) and couldn’t wait to get her take on science fiction/fantasy, especially when I learned that she had penned a story starring Leia Organa! ; 2. Star Wars, particularly Star Wars arcs that focus on female characters, is awesome. I haven’t delved very deeply into the Expaneded Universe, but what I’ve read I’ve loved and one of my goals for 2014 is to get a few more EU titles under my belt; and 3. This week is a Star Wars nerd’s dream – Rebels! New York Comic Con! And lots of posts like this all the time! Leia Organa is having a bad day. On a mission to negotiate the purchase of desperately needed goods in Mid Rim, a spotty area in the barren Eschaton system, Leia’s transport freighter is fired upon and nearly destroyed by an Imperial corvette. Though they manage to escape the clutches of the Empire, Leia, Han and the crew of the Gamble stumble across an Alderaan gunship – unfortunately, it appears that the unaccounted for survivors from Leia’s obliterated home world have since turned pirate. Taken aboard the Aegis, Leia grapples with her anger and frustration at her fellow Alderaans and the pillaging, cutthroat pirates they have become – but she’s not without hope. As the Empire closes in on Leia’s location, it is up to the princess and her allies to stay alive and stop the Mid Rim pirate armada from their murderous, slave-trading ways. Oh, and maybe even redeem the newfound Alderaan refugees, convert them to the rebel cause, and make sure Echo Base gets built on ice planet Hoth. I want to preface this review proper with an admission: I love Star Wars. I love it a whole bunch. I own and rewatch (and, yes, kinda like) the prequels, I’ve seen the Clone Wars beginning to end at least 3 times (I am SO excited for Rebels), and, of course, I’m enamored of the original trilogy. Beyond the animated shows, however, I’ve not explored much of the Star Wars Expanded Universe – earlier this year I had the immense, gleeful pleasure of reading The Courtship of Princess Leia by Dave Wolverton, and immediately resigned myself to reading more EU books. When I saw this new arc, to be penned by Martha Wells, James S.A. Corey and Kevin Hearne, each book following a different main character in the context of the original trilogy, I was ecstatic. I was even more ecstatic when I discovered that Martha Wells would be writing Leia’s story. So, context completed, let’s jump into the story shall we? Razor’s Edge starts with a bang (or, rather, blast), and continues on for the next 300 pages fraught with high stakes, and deadly perilous encounter after deadly perilous encounter. Set between the events of Episode IV: A New Hope and Episode V: The Empire Strikes Back, Razor’s Edge is an interesting exercise in continuity, existing character development, and, to some extent, inevitability. This inevitability seems to characterize so much of the interstitial stories of Star Wars’ EU (see the aforementioned Clone Wars as just one glorious example), but in Razor’s Edge this predetermination effect is magnified even more significantly because it’s set during such a specific point in the original trilogy arc, and follows three of the original main characters.1 Within this context, there’s freedom for Leia, Han and Luke to have ancillary adventures and storylines, but ultimately you still know that the Empire is going to fall, that Leia, Han and Luke all survive and build a new intergalactic future together. It’s a strange reading experience, knowing where they will all end up eventually. I’ll be interested in reading other adventures where there is more freedom to explore characters whose fates aren’t quite so concrete. To that end, there’s a whole lotta pressure on Martha Wells regarding continuity know-how and character development – especially with regards to her portrayal of Princess Leia Organa. I am delighted to say that Wells does a phenomenal job on all fronts – not only is the writing style strong and very much in the Star Wars operatic vein, but she also manages to stay true to the Leia of the films (and, ostensibly, other Star Wars EU novels), while simultaneously giving her character more depth and emotional resonance. Something that I always felt was glossed over in the films, but subsequently addressed in EU novels, is the horrific fact that Leia lost her entire home planet. Not only did she lose Alderaan completely, but she saw the planet blown to smithereens right in front of her eyes. There’s an immense amount of survivors guilt that comes with that kind of genocide, especially for the last monarch and powerful head of state of a now endangered people. Wells addresses this horror head-on in Razor’s Edge, and gives Leia a whole new layer of motivation – this is a character who feels responsible for her people, and understandably is both enraged and hopeful when she discovers an Alderaan gunship and survivors. It was like having an old wound ripped open, except this wound had never closed. She had just learned to pretend it didn’t exist, most of the time. The Leia that Wells portrays in Razor’s Edge is a no-nonsense seasoned diplomat, but one who is impassioned about finding her people, and even more dedicated to the rebel cause because of everything she has fought for and lost. But beyond her feelings for her people, this version of Leia is not only a competent leader, but an intelligent and cunning negotiator who can handle herself with a blaster. I love Leia of the films for all of these reasons, but given her own book and her own internal narrative? It’s pretty freaking fantastic. I should mention that this additional depth isn’t limited to just Leia, either! There are so many other main female characters in this novel – the captain of the Alderaan pirate gunship is a woman, as is the leader of the Mid Rim pirate armada. Leia had grown up with the Rebel Alliance and bent most of her life and will toward it, but she wasn’t so narrow that she couldn’t see Han’s perspective. She just felt compelled to argue with it a lot. And, of course, plenty of screen time is given to the trilogy’s other stars, Han Solo and Luke Skywalker (as well as Chewy, Artoo and Threepio). Writing these characters in a way that feels authentic and captures their various quirks and mannerisms is no small feat, but Wells does it beautifully. Most of all, I loved the relationship between Leia and Han in Razor’s Edge, which is still in the ‘I hate you but I really like you a lot but I’m not going to tell you that’ phase – again, Wells nails it. Brilliantly. On the Dark Side of the reading experience, if you’ll pardon the extremely lame pun, Razor’s Edge is very much a straightforward episode-of-the-week kind of book. It’s chock full of action, which makes for a lighthearted read, but devoid of any greater depth or gravitas so far as the original trilogy arc is concerned. Also, there aren’t enough lightsabers. But that’s not necessarily a bad thing. 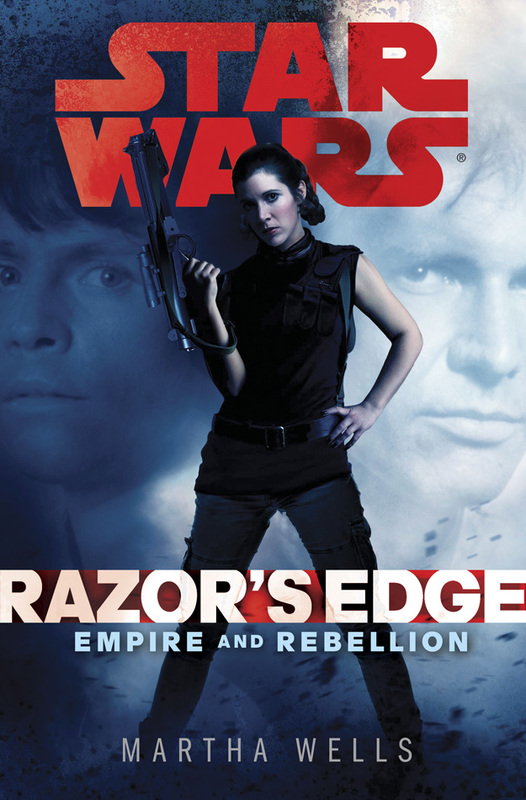 Ultimately, Razor’s Edge is an entertaining, thrilling episode in the Star Wars universe. It’s not a paradigm-shifting novel, but it’s one that I enjoyed very, very much, and I cannot wait to read books 2 and 3 in the Empire and Rebellion arc. Absolutely recommended. Leia Organa had a bad feeling about this. “At least their timing is spot-on,” she said, watching the transmission download on the comm screen. She and General Willard were on the Gamble’s small bridge, where Captain Denlan and Lieutenant Esrai occupied the pilot’s and copilot’s seats. They had just exited hyperspace, the starfield steadying in the viewport as the ship slowed to sublight speed. “Well, we didn’t,” Leia said, more sharply than she had intended. If only the Rebel Alliance could have afforded to equip all its ships with the comm equipment necessary to receive hyperwave transmissions, this vulnerable moment could have been avoided. Still, so far the mission had gone as planned. There was no reason she should be on edge like this . . . but she was. At least, she told herself, they wouldn’t have to wait around for long. “We have it.” Leia turned her chair around to face the computer console and checked the log to make certain the entire message had been recorded. It had. Now they just needed to decode the transmitted coordinates and program the jump to the meeting where they were to negotiate the purchase of raw materials for the construction of Echo Base, the new secret headquarters of the Rebel Alliance. With the base so near to completion, the last couple of months hadn’t been easy. So many things had gone wrong, and the Alliance was dangerously short on resources. Leia would allow herself to breathe a little easier only when this mission was over and the materials secured. She started to turn her seat forward. Then something hit her from behind and slammed her into the console. The safety straps ground painfully into her chest. Her ears rang and her eyes watered; heat washed against her neck. A heartbeat later she realized it had been a blast impact. Anybody else thinking “Excalibur” right now?